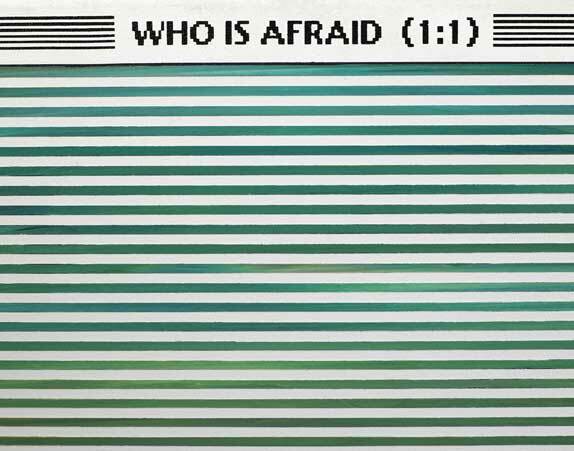 George Pusenkoff - Who is Afraid (2001). MOSCOW.-The Moscow Museum of Modern Art presents Who is Afraid - a major retrospective devoted to the art of George Pusenkoff, one of the preeminent artists of our epoch. Born in the Soviet Union in 1953, Pusenkoff currently resides in Germany, consistently reinforcing his firm international reputation and critical acclaim gained over the last two decades. The current exhibition is the first in Russia since the artists celebrated one-man installation show at the Tretyakov Gallery, which took place in 2004. The exhibition, opened 16 October  11 November 2007 at all five floors of the Moscow Museum of Modern Art at Yermolayevsky pereulok, focuses on Pusenkoffs abstract works from all periods of his diverse artistic career. In total there are 300 pieces in a variety of media, including the ones representing his Digital Expressionism, Digital Action Painting and the noted Erased Paintings series. A definite highlight of the show is Pusenkoffs metal sculpture, exhibited in Moscow for the first time ever. A substantial part of the display consists of works created specifically for the present exhibition project. The central piece of the exposition is the eponymous Who is Afraid  a richly-textured non-figurative mosaic of digital impressions composed of 145 discrete pictorial elements. It serves both as a pivotal manifestation of Pusenkoffs current artistic concerns and an embodiment of the main thematic framework of the exhibition that encompasses all displayed pieces. Pusenkoff brings forth the insecurity of modern existence that is erratically poising on boundary states of individual emotional experience and submergence into the myth of digital utopia. The exhibition at the Moscow Museum of Modern Art is accompanied by a large-format catalogue in English and Russian containing essays by respected international art critics. A variety of special events are planned for the exhibition. Among these are regular tours through the exposition guided by the curators and invited experts; a master-class conducted personally by George Pusenkoff; a round table discussion with the artist and a host of international critics and curators participating.